Where is the Penn Hills Police Department located? The police department is located within the new municipal complex, at 102 Duff Road, Pittsburgh, Pennsylvania 15235. The main entrance to the police department is located on the left side of the building and is accessible 24 hours a day, with an emergency phone available to connect you to the Allegheny County Emergency Services 911 Center. How do I file a police report, report a crime, or speak with a police officer? You may come directly to the police department and pick up the phone in the lobby and request to speak with an officer. You will be connected with the Allegheny County Emergency Services 911 Center. They will notify an officer to respond to meet you there. You may also call 911 and request to have an officer respond to your residence or other location, provided you are in the Municipality of Penn Hills at the time. If you just have a question or some other minor issue that needs to be addressed, you can call 911 and request a phone call from a police officer. How do I obtain a copy of a police report or an accident report? Is there a fee for this? To obtain copies of reports you will need to speak with an employee in the Records Division. There are fees assessed for most types of reports. There may be restrictions on obtaining certain reports, such as reports containing juvenile information and active investigations. For additional information on hours of operation and a fee schedule, please visit our Records Division page. To obtain an accident report, please visit our CRASHDOCS page to learn how you can purchase and print your report online, without having to visit the Records Division. Why do I have to call 911 to speak with the police, even if it is not an emergency? Can I just call the police department instead? The police department discontinued the use of its dispatching center in 2005 and transitioned to the Allegheny County Emergency Services 911 Center for all police dispatching services. The center is located in the Point Breeze section of the City of Pittsburgh and provides dispatching services for a majority of police departments in Allegheny County. The technology used by the center is state-of-the-art and has benefited the police department in many ways, such as their ability to geographically map cellular phone locations in emergencies, as well as the use of advanced Computer Aided Dispatching software linked to police vehicles. You should dial 911 when requesting police assistance, ensuring that you receive a timely response, especially during an emergency. As of now, there is not a “non-emergency” number available to the public that will connect you to the center. I dialed 911, and the call-taker is asking me a series of questions. Is this necessary, and do I need to answer everything? Dialing 911 is the first step to receiving the help you may be requesting. The 911 operator will ask you a series of questions to ascertain the most appropriate response to your problem. We strongly urge you to co-operate with the call-taker and give them detailed answers, if possible. Please be patient. There is likely a very good reason for the questions being asked, and in most cases it’s done to benefit you. Answering the call-taker’s questions will aid them in determining the priority level for your call, which in turn may dictate the response time by the police. It also allows the dispatcher to provide the officer(s) responding with information that better prepares them to handle your call, and in some situations alerts them to potential safety concerns. Dialing 911 and hanging up is not recommended, even if you wish to remain anonymous. The police will be requested to respond, but with no information available, the response would likely not be expedited as it would if there is a known emergency. You are not required to leave your name if you do not wish to. I just saw something suspicious, possibly a crime in progress. Should I call 911? The Penn Hills Police Department encourages you to call 911 as soon as possible to report anything you feel is suspicious or believe to be criminal activity. Many times people are hesitant to call the police when they see things because they believe we are too busy to deal with it, or they don’t believe it to be that important. We can’t stress enough that your tips are important to us, and that we will respond to any report of criminal or suspicious activity in a timely fashion. Some of the most useful crime-fighting intelligence we gather comes in the form of 911 calls from concerned citizens. Calling 911 immediately allows our officers to respond to crimes in progress as they are being committed, or shortly afterward, with a higher chance of catching those responsible for them or identifying suspicious people in the area at the time. Several years ago, after the events of September 11, 2001, the New York Metropolitan Transportation Authority introduced the slogan “If You See Something, Say Something™,” which has since been adopted by the US Department of Homeland Security to encourage citizens to report suspicious or unusual activity to local law enforcement authorities. The Penn Hills Police Department recognizes the importance of this slogan, and we encourage our residents and visitors to follow this philosophy when they observe suspicious, unusual, or criminal activity occurring. My address is in Verona, Pennsylvania with a 15147 zip code. Do I receive policing services from the Penn Hills Police Department or the Verona Police Department? A large geographic portion of the 15147 zip code falls within the Municipality of Penn Hills, even though listed as Verona. 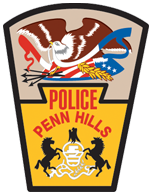 The Penn Hills Police Department handles policing services for this region. The most common way to determine if you are within the Municipality of Penn Hills is to check to see which locality you pay wage or property taxes. If you are unsure, you may call 911 and provide your address or location to the operator. They will be able to determine which police agency to dispatch. I live in Penn Hills, but I was the victim of a crime or involved in an incident/car accident in another community. Can I file a report with the Penn Hills Police Department? In most circumstances, you will be referred to contact the law enforcement agency having jurisdiction where the incident or crime occurred. We will be happy to aid you in determining which agency you will need to contact if we are unable to file a report or investigate a crime that occurred elsewhere. Who is the magisterial district judge for the Municipality of Penn Hills and where is their office located? The elected magisterial district judge serving the Municipality of Penn Hills is Anthony L. DeLuca. Magisterial District Court 05-2-06 is located at 85 Universal Road, Pittsburgh, Pennsylvania 15235. Their phone number is (412) 731-0815. This office also serves Wilkins Township and the Borough of Verona. Where is the satellite office of Family Division court in Penn Hills? Their office is at 12000 Frankstown Road, Pittsburgh, Pennsylvania 15235. The phone number is (412) 350-5600. This office should not be confused with the magistrate’s office. They are two entirely separate entities performing different functions. This office deals mainly with child support issues. How do I file for a Protection From Abuse (PFA) order? Protection From Abuse (PFA) orders must be issued by a magisterial district judge or a common pleas court judge. The police do not issue PFA orders. They are only responsible for enforcement of the orders. To file for a PFA order, victims of domestic violence should report to the third floor of the Allegheny County Court of Common Pleas, Family Division, at 440 Ross Street, Pittsburgh, Pennsylvania 15219. Their hours of operation are 9:00 AM and 11:00 AM, Monday through Friday, except on court recognized holidays. If you cannot arrive during the hours specified by Family Division court, you should contact your local Magisterial District Court for instructions on filing a PFA complaint at his/her office during their regular hours of operation. If neither Family Division court nor your local Magisterial District Court is open, you can go to Allegheny County Night Court in the Municipal Courts Building, 660 First Avenue, Pittsburgh, Pennsylvania 15219 (next to the Allegheny County Jail). Their phone number is (412) 350-3240. This office is available to aid victims of domestic violence Mondays through Thursdays from 6:00 PM until 6:00 AM, and Fridays from 6:00 PM until Mondays at 6:00 AM. What should I do if a police officer signals for me to pull over? If you are driving and a police officer signals for you to stop you should pull your vehicle to the right side of the roadway and come to a stop as soon as it is safe to do so. Remember that all police vehicles in Pennsylvania, marked and unmarked, will use both red and blue flashing lights. Once you have stopped it is best to try to stay calm, keep your hands in an area that is visible to the officer, avoid making any sudden movements that could alarm the officer, and stay inside your vehicle. If you’re stopped, and it is dark outside, turn on your vehicle’s interior light. Once the officer approaches your vehicle, he or she will inform you of the reason for being stopped. You will usually have an opportunity to explain your driving actions that led to the stop. You’re required to display a valid driver’s license, current insurance paperwork, and current registration paperwork. The officer will check the documents you provided to make sure that they are valid, and will respond by either issuing you a state traffic citation, a written warning notice, a verbal warning, or making an arrest if one is warranted. If you’re issued a citation you’ll be asked to sign for it. You are not admitting guilt; it’s merely an acknowledgement that you received your copy. If you do not agree with it you can request a hearing in front of a Magisterial District Judge to have your case heard. It’s important to listen to the officer’s instructions during the traffic stop. You should avoid becoming engaged in an argument with the officer, reaching for anything before being directed to do so, exiting your vehicle unless being asked to do so, or driving away until being re told you are free to leave. I received a traffic citation after being pulled over by a police officer. Will I receive “points” on my driving record if I plead guilty or am found guilty of the violation? Not all traffic offenses carry demerit points upon conviction. Most infractions that involve the unsafe or careless operation of a motor vehicle will add demerit points to your driving record. To view a list of offenses that carry demerit points upon conviction, click the following link from the Pennsylvania Department of Transportation. How do I pay a traffic citation that I received? If you received a traffic citation and planned to plead guilty and pay the total amount due on the citation, there are several options available to arrange payment. Reading over the instructions on the back portion of the citation will explain the options available to you. To pay in person you will need to visit the magistrate’s office that is listed in box number 3 on your citation. Please do not come to the police station to pay a traffic citation. We do not accept payments for citations. To pay by mail, you will need to send a check or money order to the magistrate’s office listed in box number 3 on your citation. Do not mail cash. You may also pay a traffic citation online by visiting www.alleghenytix.com and following the directions on their site, or by calling (877) 793-7955. How do I pay a parking ticket that I received? All municipal parking tickets must be paid within five days of issuance. This can be done by visiting the Records Division, located inside the main entrance to the municipal building, or by mailing the ticket and payment to the municipal building. You must come during their normal hours of operation. Tickets can be paid for by US currency, personal checks or money orders. Please don’t mail currency. Failing to pay for a parking ticket could result in a state traffic citation being issued via US mail. A “reportable crash” is any accident that involves an injury to any person involved or damage to any vehicle that would render it inoperable and require towing. Reportable crashes must be reported to the police, as required by Pennsylvania law (75 Pa.C.S. §3746). “Non-reportable crashes” do not involve injuries to anyone involved, and any vehicle involved must be drivable following the collision. A police report is not required by law. What should I do if I’m involved in a vehicle accident? What information do I need to gather from the other motorist(s) involved? If possible, move your vehicle to the side of the roadway or another safe parking place to avoid secondary collisions from passing motorists and creating traffic congestion. If someone is injured, or vehicles are heavily damaged and cannot be moved, call 911 and request emergency assistance. If you’re involved in a “non-reportable crash” you are not required to report the collision to police, though you can still request police to respond if you require assistance. Regardless of fault, each driver involved in a vehicle accident is required by law [75 Pa.C.S. §3744(a)] to produce this information upon the request of the other person(s) involved, or upon the request of a police officer. If a driver refuses or cannot produce these documents, or asks to leave or not involve the police, call 911 and request police assistance. We recommend that you record the location of the accident, time of day it occurred, any witness information, vehicle descriptions, and anything else you believe to be significant. What are the most common reasons that a police officer may tow a vehicle? There are many reasons that vehicles may be legally towed by the police. The most common reasons Penn Hills police officers may tow a vehicle include; lack of car insurance, expired/suspended registration plate, the vehicle operator has an invalid license and the vehicle is on a roadway, the vehicle constitutes a safety hazard, the vehicle was involved in a collision and is inoperable, or the vehicle is parked and blocking traffic/a driveway/or a business entry or exit, etc. Who do I report an abandoned vehicle to? What constitutes an abandoned vehicle in Penn Hills? Abandoned vehicles that are on public roadways can be reported by calling (412) 342-0920. The information is forwarded to officers in the Traffic Division to review. Abandoned vehicles that are on private property should be reported to the municipality’s Code Enforcement office. Their phone number is (412) 798-2132. The definition of an abandoned vehicle is found in the Codified Ordinances of the Municipality of Penn Hills. To view the ordinance please click here. The Penn Hills Police Department towed my vehicle. Where was it taken to and what do I need to do to retrieve it? Is there a fee? The Penn Hills Police Department’s contracted towing service is Don Kuhn Auto Body, located at 227 Sandy Creek Road, Verona, Pennsylvania 15147. Their phone number is (412) 795-2240 and their hours of operation are Monday through Friday from 8:00 AM to 5:00 PM, and Saturdays from 9:00 AM to 12:00 PM. Unless your vehicle was towed as a result of a vehicle collision in which you were present, you are required to present a Penn Hills Police Department “Tow Release Receipt” to have your vehicle released. The registered owner can come to the police department at any time and speak with a police officer to obtain this form. You must present valid photo identification to verify that you are the owner. There will be fees associated with the towing and storage of your vehicle. These fees are set by Don Kuhn Auto Body and must be paid to them. For more information on costs and payment instructions, please contact Don Kuhn Auto Body. Who handles complaints involving stray and lost or found dogs and cats? The Municipality of Penn Hills contracts with Hoffman Kennels to recover stray dogs or cats. Their address is 285 Cloverleaf Drive, Delmont, Pennsylvania 15626. Their phone number is (724) 468-5505. If you have lost your pet, please check with them to see if they have recovered it. You may also want to check with the Animal Rescue League and the Western Pennsylvania Humane Society if your pet was turned over by a private citizen. I have a bat, snake, or other wild animal inside my house. Will the police department remove it? No. Unfortunately, we do not have the necessary equipment to capture and transport wild animals. I have a complaint about motorists speeding or committing other traffic violations on my street. Can the police department do something about this? Complaints about regularly occurring traffic violations in a given area are forwarded to the Traffic Division. Depending upon call volume, officers assigned to this unit may attempt to conduct traffic enforcement details in that particular area to address the issue. I locked my keys inside my vehicle. Will the Penn Hills police be able to help me unlock it? The Penn Hills Police Department provides vehicle lockout assistance when a child, disabled person, or a pet is left inside a locked vehicle. You’ll be requested to read and sign an “Unlocking Vehicle Release” waiver for the officer to perform this service. The Penn Hills Police Department conducts a joint Citizens Police Academy with the Monroeville Police Department. For more information on the next available class, requirements, and location, please contact Detective William Trogler at (412) 342-1163, or visit the Citizens Police Academy page. Does the Penn Hills Police Department provide police officers for special duty details at events or businesses? If so, what is the cost to hire an officer for a detail? The police department does offer this service. There are set pay rates for officers working special duty details. There is also an additional fee if you require a marked police vehicle for your detail or event. A four–hour minimum charge applies. Officers are paid by the municipality and the payment is made to the Municipality of Penn Hills. All special duty details are subject to approval by the chief of police. To inquire about hiring a police officer for a special duty detail, please contact Lieutenant Joseph Snyder at (412) 342-0928. Please call well in advance to ensure that your request can be staffed. I have an alarm system on my house or business. Do I need a permit for this? Are fees assessed by the municipality for police responses to false alarm activations? The Municipality of Penn Hills requires a permit for alarm systems on residential and commercial properties. Please visit our Documents and Forms page for a downloadable version of this form, or you may visit the Records Department during their regular hours of operation for a copy. There are fees assessed for repeat false alarm activations. Please visit the Records Division page to view these fees. Is solicitation permitted by the Municipality of Penn Hills? If so, is a permit required and are there fees involved? Solicitation is permitted within the municipality; however, you must obtain a permit. Non-profit organizations are exempt from permit requirements but must have proof of such status. Each solicitor must provide a background check clearance to get a permit. Please visit our Documents and Forms page for a downloadable version of the application for a solicitation permit, or you may visit the Records Department during their regular hours of operation for a copy. For more information on solicitation guidelines and fees associated with obtaining permits, please view our solicitation information document. Does the Municipality of Penn Hills have a curfew for persons under the age of eighteen? If so, what are the requirements? The municipality does have an established ordinance dealing with a curfew for minors. It is unlawful for any person seventeen years of age or younger to be or remain upon the streets, alleys, parks, athletic fields, business places, or any other public places within the Municipality of Penn Hills from Sundays to Thursdays between the hours of 10:30 PM until 6:00 AM the following day, and on Fridays and Saturdays between the hours of 11:30 PM until 6:00 AM the following day. Violation of the ordinance may result in a fine of $50.00 to $300.00, as set by the Magisterial District Judge. There are certain exceptions to the ordinance. To view the ordinance, please click here. Does the Penn Hills Police Department provide fingerprinting services? If so, is there a fee? No. The police department used to offer this service; however, the use of standard ink card fingerprinting techniques have become virtually obsolete with most law enforcement agencies. Many private businesses now provide this service through the use of Live Scan technology, an electronic method of capturing fingerprints. You can visit https://www.pa.cogentid.com for additional information on fingerprinting services and locations. Does the Penn Hills Police Department provide criminal history/background checks for employment purposes or other reasons? No. Local police departments are only permitted to request criminal histories for investigative purposes, arrested persons and for police officer applicants. The Pennsylvania State Police is responsible for maintaining criminal histories of all persons arrested in the Commonwealth. A private criminal history check can be completed by visiting the state police website. There is a $10.00 fee for this service. For additional information please visit https://epatch.state.pa.us/Home.jsp. What are the laws in Pennsylvania on firearms ownership, the transfer or sale of firearms, and the carrying of concealed or exposed guns? Due to the sheer volume of laws concerning firearms, we are unable to offer clear answers to the vast number of questions related to this topic. For your convenience, we have included a link to Title 18 of the Pennsylvania Consolidated Statutes, as well as a link to the Pennsylvania State Police “Firearms Information” page. How do I obtain a License to Carry Firearms in Pennsylvania?